The Liga de Fútbol Americano Profesional (LFA) is a semi-professional American football spring league in Mexico, founded in 2016. Starting with four teams, the LFA has since expanded to eight members as of 2019. The championship game is called Tazón México (Mexico Bowl), and it is currently played on the second Sunday in May. The players are drafted from the two College Football conferences that exist in the country: ONEFA and CONADEIP. American football has been played in Mexico since 1896 and is the sixth most popular sport in the country. In 2015 a group of investors decided to offer football while the NFL, NCAA, ONEFA, and CONADEIP are in the offseason and founded the LFA, which would start two weeks after Super Bowl 50. Some of the players had not played for several years and most of them combined training and playing with other full-time jobs. Four charter members participated in the inaugural 2016 season: the Eagles, the Raptors, the Mayas, and the Condors. All teams were based in Mexico City. The first game was played February 21, 2016, between the Raptors and the Mayas, with the Mayas winning the game 34-6. The first title game, the Tazón México (Mexico Bowl), was held on April 10, 2016 between the Mayas and the Raptors. The Mayas won Tazón México I, 29-13. All games were played at the Palillo Martínez Stadium of Magdalena Mixhuca Sports City. The LFA experienced significant financial problems during 2016, with a season average attendance of only 2,000 per game. Despite the financial difficulties of 2016, the LFA expanded to six teams in 2017, with the addition of Dinos Saltillo (short for "dinosaurios", the Spanish word for dinosaurs) and Fundidores Monterrey (Spanish for smelters or founders), who took players from the college programs in the ONEFA and CONADEIP. Due to the difficulty of travel, the Dinos nearly canceled going to Tazón México II. In the end, the game was played on April 30, 2017 at Jesús Martínez "Palillo" between the Mayas and the Dinos. The Mayas maintained dominance over the league and won the Tazón México for the second time, 24-18. On October 28, 2017, Mr. Juan Carlos Vázquez left the presidency of the LFA. The title of President was eliminated and the position of the Commissioner was created, which was occupied by Guillermo Ruiz Burguete On January 16, the newly appointed LFA commissioner, Guillermo Ruiz Burguete, resigned. The league did not announce his replacement. For operational purposes, the activities of the commissioner were absorbed by the president of the board of directors of the league, Óscar Pérez. On April 22, 2018, the Tazón México was held on a neutral site for the first time, at Estadio Azul. Originally a half-time show was planned, but the band canceled due to recommendation of Civil Protection force. Tazón México III featured the Mexicas and the Raptors, with the Mexicas winning their first title by a shutout of 17-0. In November 2018, the LFA signed a non-binding Letter of Intent with the Canadian Football League to share resources and to allow for at least one CFL game to be played in Mexico. CFL commissioner Randy Ambroise said of the deal later that he hopes it'll raise the level of competition in the LFA and give Canadian football players another competition to compete in if they get dropped from the CFL. "For so many, if they finish their junior career or college career and they’re not on a CFL roster then there’s kind of nowhere to go and their dream ends, I think that’s a tragedy. This is really about growing the game of football." The CFL later held a draft in January 2019. The LFA considered expanding to 10 teams for the 2019 season, with Guadalajara, Puebla, Queretaro and even Tamaulipas among the four possible expansion candidates. However, the league only added two additional franchises: the Osos Toluca (Bears) and the Artilleros Puebla (Artillerymen). A new commissioner was announced, Alejandro Jaimes Trujillo. In January 2019, the CFL held a draft for interested LFA players, with 27 of the 51 players selected. The rules of the game are the same as those of the NFL, that is, the rules of American Professional Football. Some of the most notable rules are the instant replay reviews, the two-minute warning, the coach's challenge, and the requirement that receivers must have both feet touch the ground in bounds to complete a reception. However, the league has been criticized for not providing adequate refereeing, and it is common for some rules of NCAA football to be applied randomly in games, causing confusion among fans, players, and coaches. Like the NFL, the LFA has a salary cap. The current salary cap is $1,100,000 MXN (approximately $57,000 USD) for the entire season. On average, a player receives only $11,000 MXN (approximately $600 USD) per year. However, due to the low salary, it prevents players from professionally dedicating themselves to football full time. This not only reduces the overall level of competition, but also makes the LFA less attractive to collegiate talent that would play in the league if there was a higher salary. LFA officials want to keep the league primarily Mexican, allowing each team to only have two foreign players. Players must have finished their eligibility in college football before playing professionally. Currently, there are two collegiate leagues, the Liga Mayor ONEFA and the Liga Premier CONADEIP. In these leagues, each player can play five or six years, after which they become eligible for the LFA (they can also declare themselves eligible before finishing their period in college, but it is not usual). Each year in January, interested players and LFA teams meet in a one-day player draft. Each team can choose a player in each of the seven rounds of the draft. The draft order is determined by each teams record from the previous year; the team that finished with the worst record has the first draft pick, the team with the second worst record has the next pick, and so on. Once all the teams have made their first selection, one round ends and the second begins, until the seventh and final round. There are also complementary rounds in case any team still requires players. The best players are very coveted, so being selected in the first round is considered a great honor, especially if it is the very first selection overall. The regular season consists of 8 games: 6 divisional games (home and away series) and 2 interdivisional games (one away and one home). The season starts on the third weekend of February and ends in April. At the end of the regular season, a direct elimination tournament called postseason or playoffs begins, in which the two best teams of each division face each other in the Division Championship in the home stadium of the team with the better record. The postseason occurs between April and May. 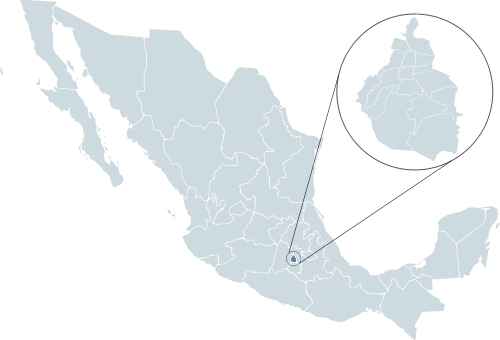 The winners of these games go to the Tazón México. The Tazón México (English: Mexico Bowl) is the title game for the LFA that determines the National Champion. The champions of the North Division and the Central Division meet in a neutral stadium. Each edition of the Tazón México is designated with consecutive Roman numerals, similar to the Super Bowl. In certain editions, the name of a company has been added for sponsorship reasons. It is expected that in the future the Tazón México will have a halftime show. The team with the most championships in the Tazón México is Mayas with two. The teams with the most appearances in this event are the Mayas and the Raptors, with two each. The current champion is the Mexicas, who defeated the Raptors in Tazon Mexico III by 17-0 at the Estadio Azul in Mexico City. ^ "For its third season, LFA will have a new face". ^ "CFL holds combine in Mexico City in effort to grow football worldwide - Sportsnet.ca". www.sportsnet.ca. Retrieved February 5, 2019. ^ "One thousand 500 pesos, payment per game in LFA".